So how many construction workers does it take to maneuver a 140,000-pound bridge beam onto 45-foot-high supports? For the Southern Beltway bridge over Quicksilver Road near McDonald in August, the answer was three — Maxim Crane to operate an All Terrain crane to lift the 150-foot beam and one at each end of the beam using a rope to guide it into place. In less than an hour, a team of iron workers had that piece attached to an abutment on one end and used plates to splice it together with a 50-foot companion attached to the other abutment to complete one side of the bridge frame. But that was only possible because of months of precise engineering work that included calculating the exact placement of the All Terrain Crane on the ground and the just-off-center clamping of the crane’s 40-foot pickup beam to the longer piece to make it easier to place. Because of the laws of physics, if those calculations by Tunstall Engineering Group of Cranberry were off a fraction, the crane wouldn’t have been able to lift the beam properly or swing it into place. “Where that crane is sitting isn’t just trial and error,” said Bob Kohlmyer, construction supervisor for CDR McGuire, the firm managing the toll road project for the Pennsylvania Turnpike Commission, as the crews worked. Just calculating the correct location of the crane on the site, exact to within one foot, took as much as two months. Crews will build nine pairs of bridges as part of the 13-mile, $700 million segment of the Southern Beltway under construction between Interstate 79 and Route 22 in western Allegheny and northern Washington County. The spans have their individual characteristics for length, style and purpose, but they share common ground in the level of engineering that goes on before the first support is put in place. Where valleys are too big to fill, streams run through an area or existing roads are in the way, road projects require bridges to be built. What motorists see are piers that can rise a couple of hundred feet above ground to support a long bridge. But what they don’t see are the extensive underground structures that provide the foundation and stabilization for those supports. Most bridge work begins with test borings to assess the condition of the ground. If the ground has solid rock under it, crews pound a series of H beams into the ground but if the rock is spotty they bore shafts 60 feet deep and install caissons for support. For the three-span, parallel bridges over Little Raccoon Run in Robinson, Washington County, workers used a lattice boom crane in June to pound dozens of H beams 50 to 60 feet into the ground. Even from a half mile away, Shaun Raul of Mosites Construction’s bang-bang-bang of the crane on the beam was jarring, striking the beam more than 350 times over about 10 minutes. The pounding didn’t stop until the beam met what’s called absolute resistance when it moves less than an inch after 20 straight smashes. The crew can do about two beams an hour. Once a series of beams is sunk, crews pour a concrete footer around the tops of the beams. Then they build forms on top of the footers to create the piers that will support three spans for this bridge, each 123 feet long. Each bridge will carry two lanes of traffic and there will be two ramps to the Beech Hollow Road interchange. Crews needed to assemble a series of caissons for the five-span, 1,150-foot bridge across Route 980 near McDonald. Like the H beams, the caissons provide the support for piers built on top of them. Here’s what goes into making the caissons: steel tubes 60 inches in diameter are dropped in a 70-foot-deep hole and lined with a cage made of 18 reinforcement bars each 2¼ inches thick. The bent ends of the bars are left sticking above the steel frame so that concrete for the pier can be built around them. Then the tubes are filled with concrete. Because the bridge over Quicksilver Road is only about 200 feet long, the setup for this concrete girder bridge was different. It consists of two beams spliced together with the ends resting on abutments built into the hillside on each side of Quicksilver. Crews planned to erect four sets of beams during four building sessions the fourth week of August. The work was done at night to reduce the inconvenience on regular traffic and golfers at neighboring Quicksilver Golf Club. A Monday session took two hours longer than expected and delayed rush-hour traffic but the crews were able to finish on time the other nights. The process actually started more than four months earlier when Mosites ordered the cor-ten steel from High Transit, a Lancaster firm that’s one of about two dozen fabricators in Pennsylvania. Cor-ten is treated steel that develops a weathered, rust color over time but is resistant to corrosion. For this project, High Transit delivered the pieces for staging at Champion Processing Inc., about a mile away from where Routes 980 and 22 meet. There, workers painted the first 13 feet of each end, where connections would be exposed to the most road salt. Contractors closed Route 980 intermittently while drivers maneuvered the long flatbeds to Qucksilver Road beginning about 8:30 p.m., where supervisors had friendly wagers on whether drivers could make the sharp turn to the construction site on one try without backing up. One of the two made it this night. 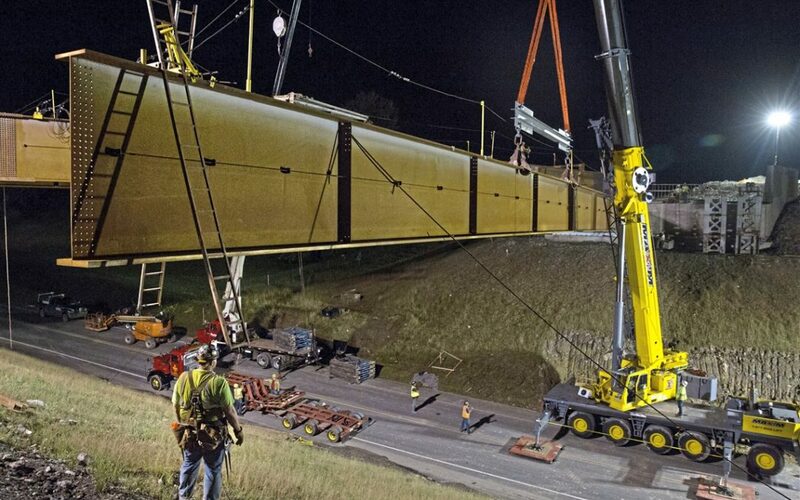 A crew of about 20 ironworkers from Abate Irwin Inc. of Eighty Four was split into two groups, one doing finishing work on the previous night’s beams and the other preparing the new beams for erection that night. The first group, attached in pairs to a series of safety harnesses, used 4-foot torque wrenches to test 10 percent of the bolts installed the previous night to make sure they had been tightened to the proper torque, 43,000 pounds. The beams measure 98 inches from top to bottom, more than enough room for iron workers to walk along the bottom rail on their testing mission. Before the new beams were moved, workers placed buckets of bolts, ladders and other tools they would need on the lower rail and installed the safety harnesses they would use once the beam was in place. The crane has a capacity of 240 tons and a 150-foot extension, but lifting the beam was so smooth, there was no worry the items would be dumped in the process. The bolts cost about $10 each and workers pretest three bolts from each bucket to make sure they meet specifications. At the same time material was being attached to the new beam, other workers were measuring precisely where to place the lifting beam so that the end that would be attached to the abutment was a little bit heavier. That would tilt it slightly when it is lifted so it is easier to fit it over top of the bolts already in place on the abutment. The process of lifting the beam was eerily quiet. Workers on each end of the beam used ropes to steer it about 45 degrees from its perpendicular position on the road under the bridge until it was parallel to the beam installed the night before. When the beam was turned a little too quickly, it struck the hillside on each side of the road, but it only took the crane operator about two minutes to adjust by lifting it higher to clear the land. When the beam was in the right coordinate, the operator gently lowered it onto the abutment, where an iron worker quickly attached a series of nuts to the bolts to hold it in place. Then pairs of workers scurried onto the beam railing to connect it to framing pieces on the beam beside it, only a few now for stability but eventually located every 10 feet. This is where the process can get noisy, as workers used sledge hammers and tapered pins to line up pre-drilled holes, then attached bolts and nuts. Some workers lay flat on their stomachs to install the bolts at the bottom of the frames. Raising the shorter beam was the trickier operation because one end had to line up with the first beam for the splice and the other rested on the abutment, where this time workers lined up holes and installed bolts. Instead of one ironworker on the abutment like the first beam, there were two to guide it into position, and another half dozen scrambled across the bottom rail to secure the splice and attach the frame. Over the next 6½ hours, crews would finish attaching hundreds of bolts for the splice and frame pieces. How many bolts on the splice? On the top, 84 bolts 5 inches long; 248 bolts in the middle, each 3¼ inches long; and on the bottom, 184 bolts 6½ inches long. In all, it took about 58 minutes to move and stabilize the beams. With that accomplished, there was no reason for the supervisors to stay. Ed Blazina: [email protected], 412-263-1470 or on Twitter @EdBlazina.